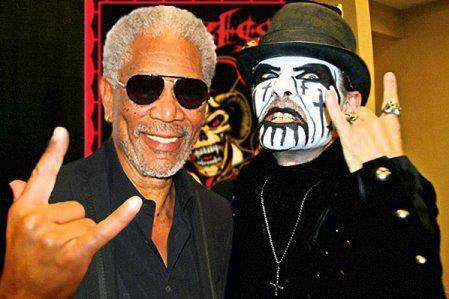 In what some critics are calling the role of a lifetime, Oscar winning actor Morgan Freeman has been selected to play King Diamond in the forthcoming biopic “King For a Day, King For A Lifetime”. Paramount Pictures, looking to capitalize on his most recent American tour, expect to put the film out by October 2015. The script was penned in less than two days by the reanimated corpse of Charles Dickens, who The King himself brought back from the dead in a Satanic ritual last week. Executives at Paramount were so impressed with the script that they have agreed to spend 100 million on the project and release it in 3-D.
Freeman was far from the only actor who was interested in the role. Actor and speed-addled lunatic James Woods campaigned hard for the role by dressing as King Diamond and robbing several banks in the Los Angeles metropolitan area. Actor Sir Lawrence Olivier was originally offered the part, but was unable get a visa to leave Purgatory for the four months of filming that would be required to complete the picture. Creating a script for The King’s life was a challenge considering he is 879 years old and has lived through most of recorded history. Distilling that much time into a 2-hour film was a challenge, but Dickens was able to pull it off. The film will focus on his music career, his survival during The Spanish Inquisition, and his extraordinary battle with Satan for control of Hell back in 1964 after an argument over the fate of singer Trini Lopez. Freeman, a major King Diamond fan who has each of the King’s solo records mounted on the walls of his Fresno, California home, has always dreamed of playing King Diamond in a film. He has seen The King 247 times in concert as a solo act and 423 times with Mercyful Fate. He even managed to catch The King with Black Rose once at a small bar in England in the 1970s. 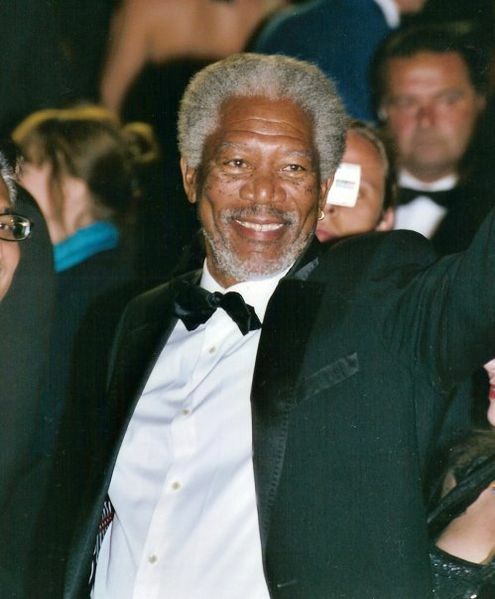 In several interviews, Freeman has cited one of his proudest moments as the time he came out on stage at a show in Dallas back in 1998 and sang “Come To The Sabbath” with The King. This entry was posted on September 25, 2011, 3:40 PM and is filed under General Weirdness. You can follow any responses to this entry through RSS 2.0. You can leave a response, or trackback from your own site. Are you sure he has the gravitas to pull off King Diamond properly? I would have though a deeper-voiced actor like James Earl “This Is CNN” Jones or Blu Mankuma might be better. Then again, it would be a bit hard to hide the … um .. “physical gravitas” of James or Blu. Maybe a voice-over, a la Darth Vader? Although there is a certain symmetry to casting Freeman in the role. Armageddon and Freeman seem to just naturally go together! this is the funiest fake stuff i have read in awhile. This would be awesome if true!! Lol!! Well…. if it’s true I think it’s friggin awesome. If it’s fake, then I like the part about him being alive for over 800 years….good stuff. Morgan Freeman lives in Fairfield not Fresno. Geeeeez. I just fired an editor! We have no margin for error in the quest for truth! Morgan would a Kickass KD, for more wider audiences ! complete bull***. MF could never portray KD. That photo is photoshopped all damn day anyway. What a joke. Someone should get Morgan to do a fake trailer for it, like for Funny or Die! Lies are just truths that haven’t happened. This is the kind of thing that makes my day.. lol.. It’s EVEN A FRIGGING Sunday and you managed to make me laugh out loud.. PROPER!!!! !